Reward charts are something I’ve used at various times over the last few years with my young children but finding one that works, keeps the child interested and is durable for multiple uses is often hard to find. Miggins & B have come up a set of reward charts that are fun, durable and a little bit different to other ones that I’ve seen and tried. 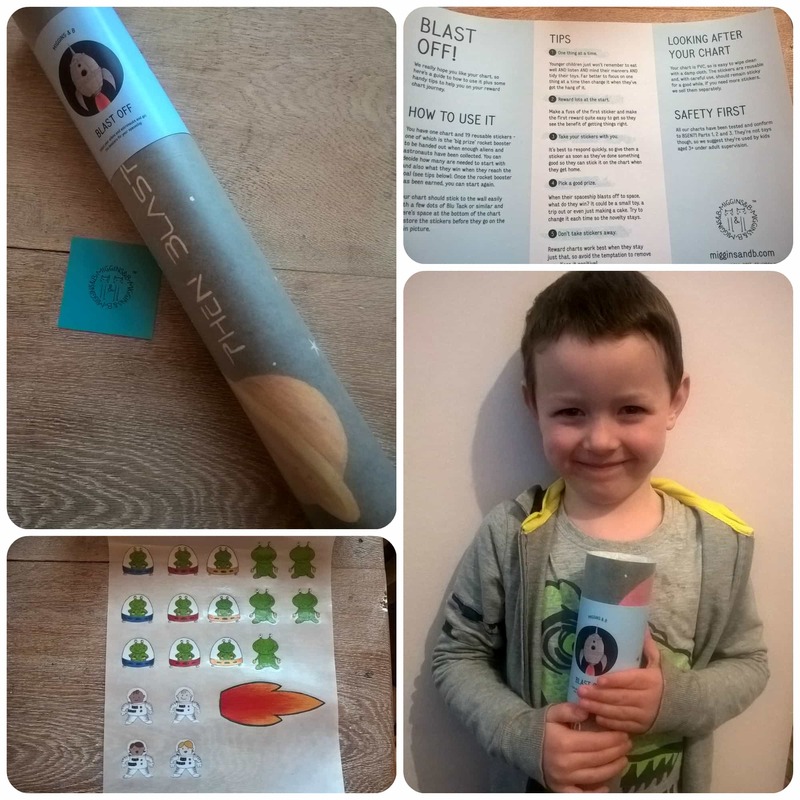 We received the “Blast Off” themed reward chart to try out with 5yr old Mister B. One of the biggest things I’m trying to tackle with him at the moment is tidying up! He forever leaves a trail of toys across the floor, particularly little bitty ones that he has several boxes for, so I thought I’d start using the chart to encourage him to tidy up. The chart arrived rolled up, and being made of a lightweight pvc, this unrolled immediately and was flat, ready to hang on the back of one of our doors. Accompanying the chart is a sheet of adhesive backed vinyl stickers that stick well to the chart but are also easily removable, enabling the chart to be used again and again. 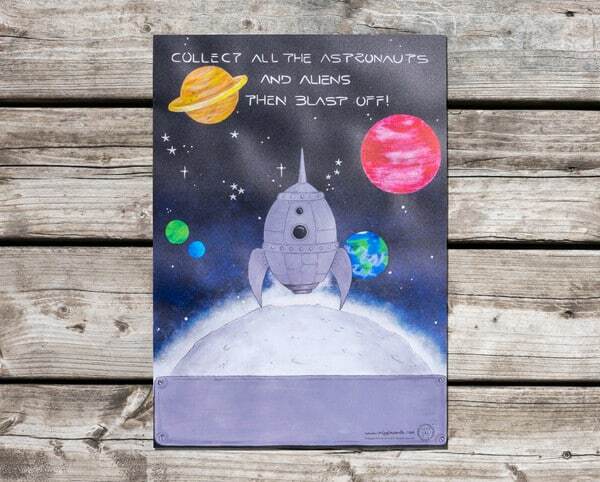 The chart is A2 in size and easily wipeable making it a durable piece. Here is Mister B with his first sticker, a little green alien. What I like about this chart is that the child can choose whereabouts they wish to put the stickers and it allows them to make up their own adventure. Here Mister B has put the alien on top of the red planet. Not only that but there is a grey space at the bottom of the chart where you can stick all the stickers and when the child gets one, they just take it from the bottom and place it higher up. This way the stickers can’t be lost and it keeps everything in one place. 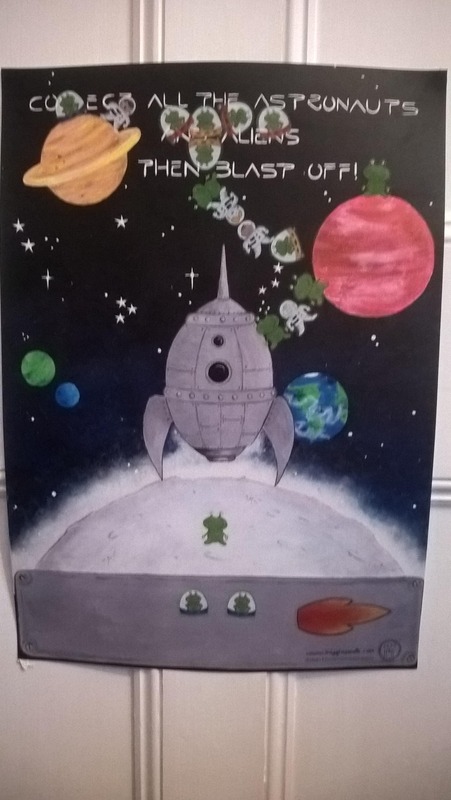 The chart comes with a total of 20 stickers with one being larger than the rest, in this case it is the rocket booster which can be the final sticker that the child earns each time. Mister B loved this concept and has made his own unique story each time he’s gone through the chart and is always eager to make the rocket blast off into space. 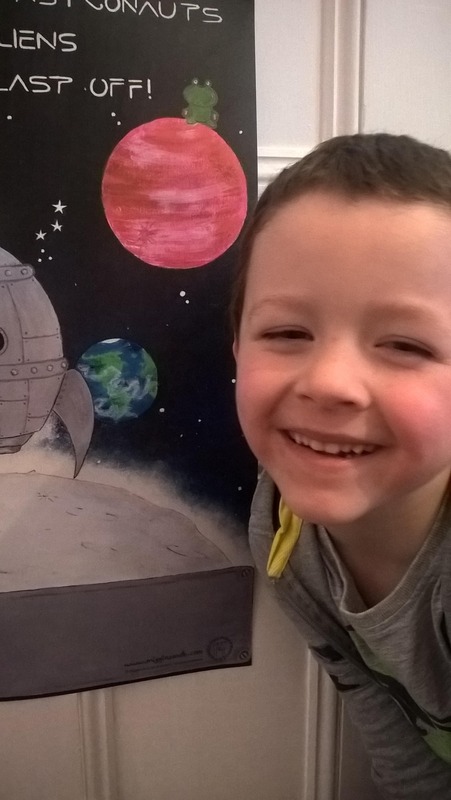 Here is his first adventure, apparently all the spaceman and aliens had got stuck on the planets and had to make a chain back down to the rocket! The ultimate challenge was to get the rocket booster which meant that the chart was complete and Mister B would then get the chocolate coin that awaited him. 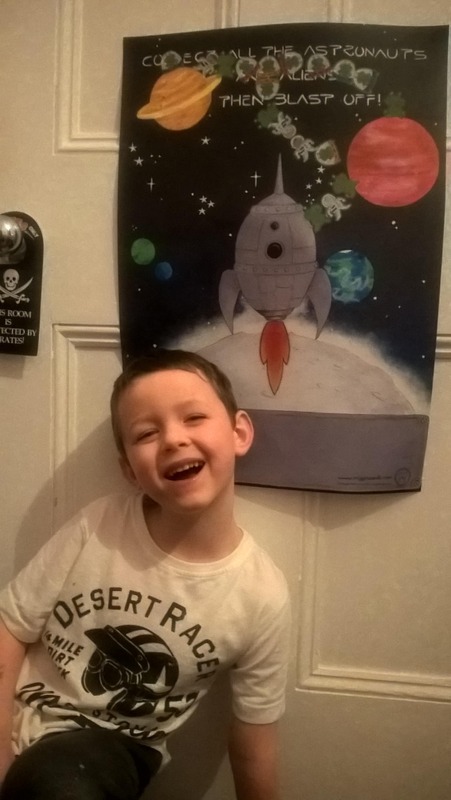 Look how proud he is of finally achieving his goal and I can honestly say we have had a much more tidier and helpful little boy around the house this past week – a big success! Miggins & B have a variety of charts available to suit different children such as football, dinosaurs, flowers, fairies and horses. If you are looking to encourage better behaviours in your child then do pop over and check them out as a better behaved child makes for a happier household! All reviews are my own and my family’s opinions and we received the chart in order to write an honest review.